With the 6th edition, the authors continue to take a fresh, thoughtful look at the key skills necessary for personal and managerial success today. 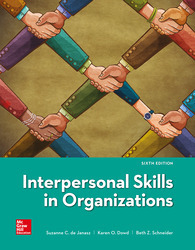 Organized into 4 distinct sections (Understanding Yourself, Understanding Others, Understanding Teams, and Leading), the text follows an experiential approach and is full of exercises, cases, and group activities. CONNECT: A highly reliable, easy-to-use homework and learning management solution that embeds learning science and award-winning adaptive tools to improve student results (applied & practical, results-driven technology).